SB175 2-pole housing in Gray color. Invented by Anderson Power Products®, the innovative SB® connectors provide cost-effective reliability, design flexibility and mistake-proof capability for your products' manufacture, installation and maintenance. APP's 2 & 3 pole connectors are available for 50, 120, 175 and 350 amp ratings for use to 600 Volts continuous AC or DC operation. 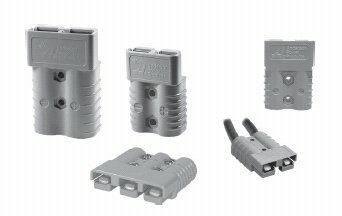 There are SB® connectors for many applications and wire sizes, #16 (1.3 mm²) to 300 mcm (152.0 mm²). Mechanical keys ensure connectors will only mate with connectors of the same color. Different color housings are selected to identify voltages, thus preventing mismatching of the power supply system. The housings are interchangeable and genderless interconnects. Insert contacts into housings and plug together for a clever, simple and low-cost solution to power interconnection. Low-detent contacts are also offered for low insertion/withdrawal force applications. Contacts are available in reeled and loose piece designs to support all production needs from very high volumes to engineering prototype and low-volume customized products. Markets: UPS Systems, Telecommunications, Forklift Trucks, Wheelchairs, Electric Vehicles, Chargers, Power Electronics & Much More.